Welcome to Day 3 of Writing New Adult Fiction Launch Week. 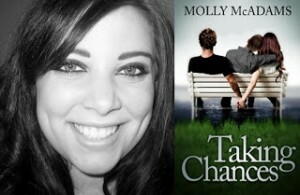 Today, a “Free 1st 20 Pages Critique” giveaway, advice for deciding if your NA fiction should have multiple narrators, tips for smooth POV switching, and a peek at author Molly McAdams’s efforts to coax a voice from a new narrator in Book Two of her bestselling Taking Chances series. Hope you find it informative! *Scroll down to enter today’s giveaway. Congratulation’s to yesterday’s winner, Kimberly Durtschi! Using multiple narrators to tell your story from different points of view is a popular and fun storytelling device in New Adult literature. Multiple POVs are great for injecting conflict by having two characters report the same event differently (with neither one lying! ), for causing conflict by having two characters process the same event to different ends and requiring different actions, for allowing readers to connect intimately with multiple characters, for working in information that a single narrator couldn’t know, and for providing alternate insights or opinions. But there are risks if you mishandle your multiple POVs. Switching from character to character can distract or jolt your readers or stutter your story’s momentum. Or, your efforts to connect readers with multiple characters can overwhelm those readers—and you. You may use multiple narrators in a single book, or you can switch narrators from book to book within a series. As Molly’s experience makes clear, switching narrators is most powerful when each narrator can contribute something new to the story—new insights, information, or opinions—rather than simply offer a second voice. This is especially important if you’re covering scenes that readers already witnessed through another narrator (“mirroring”). The switching should add depth, not just pages. Otherwise you’re just rehashing the same scene, making the POV shifts feel repetitive rather than revelatory. Who is the best character(s) to tell this story? What will an additional perspective add to the story? Can I show readers what’s going on in the other character’s head through his actions, body language, dialogue, and choices instead? Can each character consistently bring new information to the story to make the switching rewarding for readers? Do my readers need to know what’s going on in that other character’s mind? In real life, we can’t know exactly what’s going on in our closest friends’ heads. Miscommunication stems from that blind spot, and miscommunication is a novelist’s friend. Give the narrators vastly different voices and outlooks on life. Trade narrators at scene or chapter breaks rather than mid-scene, reducing jolts or pacing stutters. Be consistent about switching, establishing a rhythm or pattern that you can strategically break for powerful dramatic deviation. Use the switching as a tension-increasing device, timing some switches to create cliffhangars as you temporarily deny readers the information, insights, or reactions they crave. Clarify the switches. You could write one narrative in present tense, another in past; use first person (I, me) for one, and third person (he, she, they) for the other; or use the narrators’ names as the chapter titles. Don’t be afraid to experiment and find the perfect mix of POV strategies for your NA lit. A few days of experimentation pay off big time when you end up with the perfect balance for your story. Use the Rafflecopter form below to enter today’s “Free 1st 20 Pages Critique” giveaway. NA, YA, Adult… any fiction WIP is okay. (And you’re still eligible for the Friday Full MS edit giveaway, too.) Good luck! Yes, one must beware of the switches that are done because it’s time to hear from the other character. Look for some kind of connection or advancement from each new scene, just as in any scene in a book with a single narrator. Always moving forward. I’ve fixed the Rafflecopter widget, gang, so the contest is working now. Golly, that was a surprise to wake up to this morning — thanks to all who sent me emails to alert me to the widget’s wackiness. Congratulations to Kimberly Durtschi, winner of yesterday’s free critique giveaway! I’ll send you a direct email, Kimberly. Good luck to all in today’s giveaway! First of all, congrats to Kimberly! Secondly, I’d never thought I was skillful enough to write multiple POV. But, after reading this, I think I will give it a try since my YA novel has two very different (gender and race) primary characters, and the story could greatly benefit, I think, from having the different POVs in, say, the different chapters. Thanks! I use to write everything mutiple POV until I realized I was using it as a crutch for lazy writing. (a lot of telling rather than showing) I think I’ve grown a lot as a writer over the last few years and thanks to your advice I’m going to try it again w/ my current wip, but keep it in check. I write mostly first person, but at times wish I could jump into another character. It could make things easier. Scary for me.